The silver-mining stock soared triple digits this year, thanks to a trio of catalysts. Here's a look back at what made 2016 a year to remember. One of the drivers of Hecla Mining's success in 2016 has been the recent completion of organic growth projects across its four operating mines. These projects pushed its silver production up to 13.2 million ounces through the third quarter, a 66% year-over-year increase, while gold output rose 32% to more than 170,000 ounces. As a result of this growth, Hecla Mining is on pace to deliver the highest silver-equivalent production in the company's 125-year history. In fact, during the third quarter, Hecla's realized silver price was up 34% year over year, while the realized gold price was 20% higher. Those higher prices enabled Hecla to cash in on its rising output during the quarter, with revenue up 71% over the prior year to $179.4 million. In addition to that, the company also benefited from falling costs. For example, cash costs after by-product credits dropped 52% year over year in the third quarter to just $3.68 per ounce of silver, due primarily to higher silver production, which increased its scale. 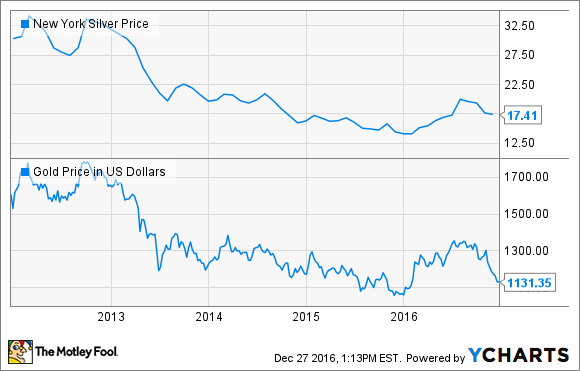 The combination of rising prices and production along with falling costs proved to be powerful for Hecla Mining in 2016. That was evident last quarter when adjusted EBITDA (earnings before interest, taxes, depreciation, and amortization) rocketed 323% to $75.2 million, and cash flow from operations surged 225% to $87 million. In fact, cash flow was so robust that the company generated $27.7 million in free cash flow during the third quarter, up $38 million over the prior year. Hecla Mining's ability to produce free cash flow helped drive a significant improvement in its balance sheet. Overall, the company's cash position rose $33 million last quarter to $192.4 million, which, combined with rising earnings, pushed its leverage ratio (net debt to adjusted EBITDA) down to 1.4. That's a 49% decrease in its leverage ratio over the past year, putting the company in its strongest financial position in years. One of the major storylines in the mining sector this year was the dramatic improvement in mining-company balance sheets, primarily thanks to their ability to generate free cash flow. For example, leading gold miner Barrick Gold (NYSE:GOLD) produced $1.13 billion in free cash flow this year, despite lower production as a result of recent non-core asset sales. This excess cash, along with cash on the balance sheet, enabled Barrick Gold to pay off $2 billion in debt this year, meeting its 2016 goal. If not for this ability to generate free cash flow, Barrick and Hecla would not have made as much progress in improving their balance sheets this year without selling assets. 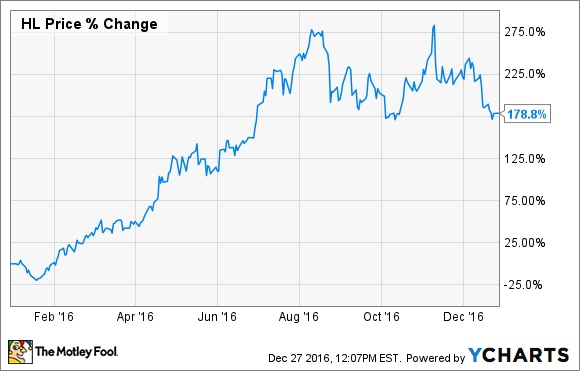 Hecla Mining performed exceptionally well in 2016. All four of the company's mines delivered strong production, putting the company on pace for its highest output ever. Meanwhile, rising precious-metal prices and falling costs enabled the company to generate a tremendous amount of free cash flow, which led to a dramatic improvement in its balance sheet. While it will be tough for the company to repeat its performance in 2017, the company does enter the year with an excellent financial position, which gives it the flexibility to capture opportunities that arise in the year ahead.